A Beast Digimon born from the fusion of sun-watching data. It has an innocent personality due to its sense of justice being powerfully sincere. 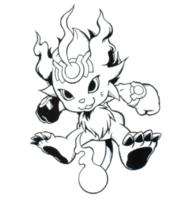 Its Special Moves are releasing continuous punches with its fists heated by the power of flame (Corona-knuckle), and a flaming shot which concentrates the power of flame in its brow while exhausting all of its body's stamina, then fires it at the opponent (Corona Flame). 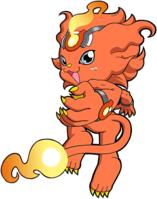 Also, it can clad its body in flames, and either defend itself or ram the opponent (Petit Prominence). A Beast Digimon born from the fusion of sun-watching data. It has an innocent personality due to its sense of justice being powerfully sincere. A Beast Digimon born from the fusion of sun-watching data. It has an innocent personality due to its sense of justice being powerfully sincere. n., A corona is a slightly colored ring of light seen through haze or clouds around a celestial body, such as the Sun. Latin root comes from "Crown". Anime/Manga Digimon Xros Wars: "Sweets Zone, The Sweet-toothed Digimon Battle!" Corona Flame  コロナフレイム Korona Fureimu By exhausting all of its physical strength, it fires a flaming shot at the opponent by concentrating the power of fire on its forehead. 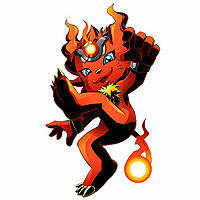 Corona-knuckle  コロナックル Koronakkuru Fires continuous punches with its blazing fists through the power of fire. 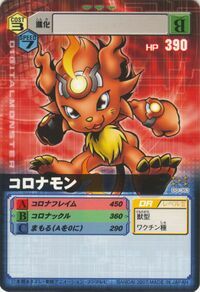 Petit Prominence  プチプロミネンス Puchi Purominensu Wrapping its whole body in flames, it defends itself or body slams. Coronamon is available as a partner in each of Sunburst's Starter packs. 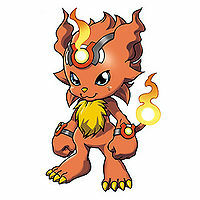 Coronamon is an obtainable Digimon. 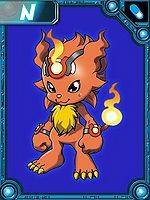 Can be evolved from Sunmon, or Peti Meramon if you win 4 battles. 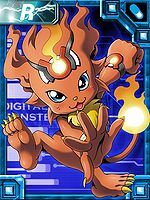 Coronamon is #061 Digimon and is a Rookie-level, HP-type, Beast-species with a resistance to the Earth and Fire elements, and a weakness to the Water element. It possesses the Death Protection and Item Liker traits, and has the special skill Ice Melt. It dwells in the Resistor Jungle. When defeated, it can drop the debug plate for Firamon. Coronamon evolves from Sunmon and can evolve into Firamon. 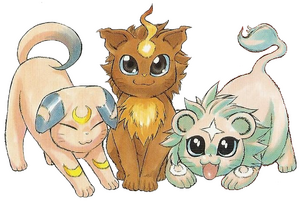 In order to evolve or degenerate into Coronamon, your Digimon must be at least level 10. Coronamon is only obtainable as a collectible card. 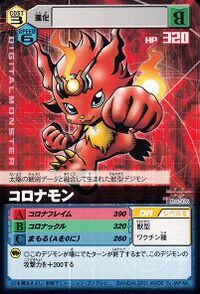 Its card is part of the Sun God of Olympos (オリンポスの太陽神 Orinposu no Taiyō Shin) set. 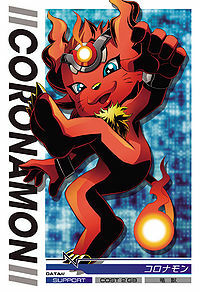 Coronamon is available as a Digimon Card. Coronamon is available as a Digimon Medal. A Beast Digimon born from fusing with solar observation data. 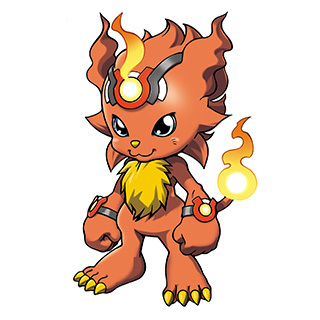 Born from the observation data of the Sun, it is a pure, innocent Digimon with a strong sense of justice. 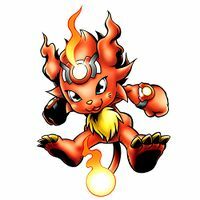 It specializes in grappling attacks that have been modified with its blazing flames, and can also use its own stamina to fire flaming bullets. This page was last modified on 12 March 2019, at 02:13.